Embedding an audio file in your content (audio player bar shows within your content). Install the QuickTime Plug-in for your Browser and Enable it. Mac: QT is integral to OSX. Must download* for Firefox and Chrome Browsers. Install the Adobe Flash Player Plug-in for your Browser and Enable it. The Flash Player is integral to Chrome. Your students will need Quick Time and Adobe Flash Player to play your audio files. Include this requirement in your Syllabus. (For more help, see the tutorial on Inserting Images Using CK Editor). Make the Title of the audio file and/or the Image a Hyperlink so that when clicked, it will open the audio file in a new browser window. Highlight the text (and image, if you use one) that you’d like to make a hyperlink. Click on the hyperlink icon in the editor. Highlight the text or image that you wish to make a Hyperlink. 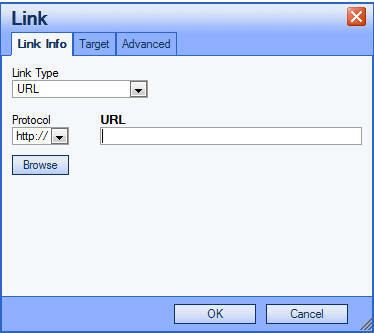 Enter the URL of the audio file that you want to link out to. Test your publisher’s audio file first in a separate browser window to make sure it plays, and poses no restrictions. The image and/or text in your editor will now be a hot link. You can test it in the Student or Preview Views. a. Locate and copy the URL of the audio file… It will now be on your Clipboard. Note: If your audio file does not have a URL (i.e. it’s a sound file on your computer), you can upload it to Resources where Etudes will assign it a URL. Then, copy the URL from Etudes and proceed as directed below. Remember that your files cannot be larger than 100 MB. Note: Copy the audio controls code from this text file to avoid copying styles from this website. c. Next, Copy the embed code you just created to your Clipboard. Place your cursor in your content in the Editor’s Text Window where you would like to insert the Audio Player. 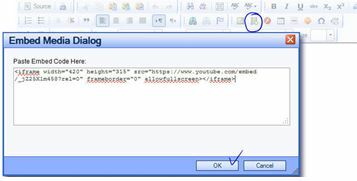 Click on the Insert Media Icon in the editor’s toolbar. An “Embed Media Dialog” box will appear. Paste the Embed Code of your Audio File and click on OK. Preview your content and test the player. This is how it will look in your content.